An element’s electron configuration represents the location of its electrons within various shells and orbitals. From this distribution of electrons we can relate the chemical and physical properties of different elements. Before you begin the electron configuration of an element it is important to remember the basic principles of quantum mechanics. The main atomic sub-levels or subshells are s, p, d and f. Each atomic sub-level has a set number of atomic or electron orbitals with each being able to hold up to 2 electrons. Using this redesigned Periodic Table is an easy way to determine the electron configurations of all elements. For example, what is the ground state electron configuration of Aluminum? STEP 1: Locate the element on the periodic table. STEP 2: Starting at the 1s orbital write the orbitals and the number of electrons involved with aluminum. This follows the aufbau principle, which in german means, “to build up”. Looking at the periodic table we find that aluminum is in Group 3A and with an atomic number of 13 has 13 electrons total. Now we simply count to aluminum while filling in our various orbitals. The full or longhand electron configuration involves going from the 1s orbital and to the last orbital of a specific element. The condensed electron configuration begins at the noble gas just before we reach our specific element. For example, the noble gas before we reach aluminum is neon. Substituting in the [Ne] is equivalent to writing 1s22s22p6 because both describe how 10 electrons are organized into orbitals. Some elements will break the order of electrons and orbitals. When an element is in its neutral form its electron configuration cannot possess a d4 or d9 orbital because of energetic reasons. For example, Copper (Cu) has an atomic number of 29 and so possesses 29 electrons. Remember that a neutral element is not allowed to possess a d4 or d9 orbital and so an electron from the s-orbital is promoted to the d-orbital. As stated previously, the electron configurations of the elements are essential in understanding the correlations between chemical and physical properties. With electron configurations we relate together Slater's rules and the Madelung rules when constructing our orbital diagrams. 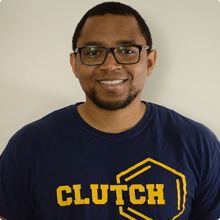 From what we've learned we can make connections with the quantum numbers, the bohr diagram when discussing the excited state vs. ground state of electrons, the periodic trends such as ionization energy, and using valence electrons when drawing Lewis Dot Structures. Give the electron configuration for the Ti 2+ ion. Which two elements have the same ground-state electron configuration? A. Cl and Ar B. Cu and Ag C. Pd and Pt D. Fe and Cu E. No two elements have the same ground-state electron configuration. When dealing with electron configurations it's best to visualize the Periodic Table in this format. The Ti2+ ion is isoelectronic with the Ca atom.Write the electron configurations of Ca. In April 2010, a research team reported that it had made Element 117. This discovery was confirmed in 2012 by additional experiments.Write the ground-state electron configuration for Element 117. The orbital diagram that follows shows the valence electrons for a 2+ ion of an element. What is the element? Consider the molecule BF3.What is the electron configuration of an isolated B atom? Consider the molecule BF3.What is the electron configuration of an isolated F atom? A friend tells you that her favorite element has an electron configuration of [ noble gas ]6s24f 145d6. Which element is it? Compare the elements bromine and chlorine with respect to the following properties.Give the electron configuration of Br. Compare the elements bromine and chlorine with respect to the following properties.Give the electron configuration of Cl. Without writing an electron configuration, determine the number of valence electrons in nitrogen. Consider the following elements: N, Mg, O, F, Al.Write an electron configuration for N.
Consider the following elements: N, Mg, O, F, Al.Write an electron configuration for Mg. Consider the following elements: N, Mg, O, F, Al.Write an electron configuration for O. Consider the following elements: N, Mg, O, F, Al.Write an electron configuration for F.
Consider the following elements: N, Mg, O, F, Al.Write an electron configuration for Al. Four possible electron configurations for a nitrogen atom are shown below, but only one schematic represents the correct configuration for a nitrogen atom in its ground state. Which one is the correct electron configuration? Which one is the correct electron configuration? Give the number of valence electrons for alkali metals. Give the number of valence electrons for alkaline earth metals. Give the number of valence electrons for the oxygen family. As we have seen, the periodic table is a result of empirical observation (i.e., the periodic law), but quantum-mechanical theory explains why the table is so arranged. Suppose that, in another universe, quantum theory was such that there were one s orbital but only two p orbitals (instead of three) and only three d orbitals (instead of five). Use the drawing of the first four periods of the periodic table in this alternative universe to answer the following questions.Which elements would be the equivalent of the noble gases? Only trace amounts of the synthetic element darmstadtium, atomic number 110, have been obtained. The element is so highly unstable that no observations of its properties have been possible. Based on its position in the periodic table, propose three different reasonable valence electron configurations for this element. The heaviest known alkaline earth metal is radium, atomic number 88.Find the atomic numbers of the as yet undiscovered next two members of the series. From its electronic configuration, predict which of the first 10 elements would be most similar in chemical behavior to the as yet undiscovered element 165. Name an element in the fourth period (row) of the periodic table with five valence electrons. Name an element in the fourth period (row) of the periodic table with four 4p electrons. Name an element in the fourth period (row) of the periodic table with three 3d electrons. Name an element in the fourth period (row) of the periodic table with a complete outer shell. Bromine is a highly reactive liquid while krypton is an inert gas.Explain this difference based on their electron configurations. Potassium is a highly reactive metal while argon is an inert gas.Explain the difference in reactivity of the elements based on their electron configurations. Potassium is a highly reactive metal while argon is an inert gas.Write the electron configuration of potassium. Potassium is a highly reactive metal while argon is an inert gas.Write the electron configuration of argon. Both vanadium and its 3+ ion are paramagnetic.Write the electron configuration of vanadium (V). The elements with atomic numbers 31 and 49 have similar chemical properties. Based on their electronic configurations, predict the atomic number of a heavier element that also should share these chemical properties. Using the periodic table as a guide, write the condensed electron configuration for the ground state of Br. Using the periodic table as a guide, write the condensed electron configuration for the ground state of Ga. Using the periodic table as a guide, write the condensed electron configuration for the ground state of Hf. Using the periodic table as a guide, write the condensed electron configuration for the ground state of Sb. Using the periodic table as a guide, write the condensed electron configuration for the ground state of Bi. Using the periodic table as a guide, write the condensed electron configuration for the ground state of Sg. Scientists have speculated that element 126 might have a moderate stability, allowing it to be synthesized and characterized. Predict what the condensed electron configuration of this element might be. The discovery of hafnium, element number 72, provided a controversial episode in chemistry. G. Urbain, a French chemist, claimed in 1911 to have isolated an element number 72 from a sample of rare earth (elements 58-71) compounds. However, Niels Bohr believed that hafnium was more likely to be found along with zirconium than with the rare earths. D. Coster and G. von Hevesy, working in Bohrs laboratory in Copenhagen, showed in 1922 that element 72 was present in a sample of Norwegian zircon, an ore of zirconium. (The name hafnium comes from the Latin name for Copenhagen, Hafnia) .How would you use electron configuration arguments to justify Bohrs prediction? Consider the first ionization energy of neon and the electron affinity of fluorine.Write the electron configuration of Ne. The discovery of hafnium, element number 72, provided a controversial episode in chemistry. G. Urbain, a French chemist, claimed in 1911 to have isolated an element number 72 from a sample of rare earth (elements 58-71) compounds. However, Niels Bohr believed that hafnium was more likely to be found along with zirconium than with the rare earths. D. Coster and G. von Hevesy, working in Bohrs laboratory in Copenhagen, showed in 1922 that element 72 was present in a sample of Norwegian zircon, an ore of zirconium. (The name hafnium comes from the Latin name for Copenhagen, Hafnia) .Using their electron configurations, account for the fact that Zr and Hf form chlorides MCl4 and oxides MO2. Consider the first ionization energy of neon and the electron affinity of fluorine.Write the electron configuration of F.
Account for formation of the following series of oxides in terms of the electron configurations of the elements and the discussion of ionic compounds in Section 2.7 in the textbook: K2O, CaO, Sc2O3, TiO2, V2O5, CrO3. The two most common isotopes of uranium are 235U and 238U.Using the periodic table in the front inside cover, write the electron configuration for a U atom. The two most common isotopes of uranium are 235U and 238U.Examine the electron configuration for Th in Figure 6.31 in the textbook. Are you surprised by what you find? Explain. Predict the electronic configuration of the first excited state (next higher energy states beyond the ground state) of Pd. Predict the electronic configuration of the second excited state (next higher energy state beyond the first excited state) of Pd. Find the ions in the periodic table that have an electron configuration of nd8 (n = 3, 4, 5...). Do Cr3+ and V2+ have the same or different electron configurations? The Ti2+ ion is isoelectronic with the Ca atom.What charge would Ti have to be isoelectronic with Ca2+? The orbital diagram that follows shows the valence electrons for a 2+ ion of an element. What is the electron configuration of an atom of this element? Both vanadium and its 3+ ion are paramagnetic.Write the electron configuration of V3+. Chlorine reacts with oxygen to form Cl2O7 (l). Prefix Meaning Mono- 1 Di- 2 Tri- 3 Tetra- 4 Penta- 5 Hexa- 6 Hepta- 7 Octa- 8 Nona- 9 Deca- 10 What is the electron configuration of chlorine in this oxidation state? Consider the first ionization energy of neon and the electron affinity of fluorine.Write the electron configuration of Ne+. The Ti2+ ion is isoelectronic with the Ca atom.Write the electron configurations of Ti2+. Treating bismuth with fluorine gas forms BiF5. Use the electron configuration of Bi to explain the formation of a compound with this formulation. Write the full electronic configuration for lead (Pb). Give the full electron configuration for sodium (Na). What is the element with electron configuration of 1s22s22p6. What is the ground state electron configuration of the sulfide ion S 2-? a) Write the electron configuration for Ni 2+. b) Write the electron configuration for Br −. a. Write the condensed electron configurations of K +, I-, Ba2+, S2-, and Al3+.b. Which are Isoelectronic with Ar? What element forms an ion with an electronic configuration of [Kr] and a - 2 charge? Give the symbol for the element. Write electron configuration for the following ion.Ru3+Express your answer in condensed form in order of increasing orbital energy as a string without blank space between orbitals. Write electron configuration for the following ion.Pd2+Express your answer in condensed form in order of increasing orbital energy as a string without blank space between orbitals. Give the ground-state electron configuration for silicon (Si). Express the complete electron configuration using superscripts where appropriate. For example,the configuration for Li would be entered as 1s22s1. Give the actual ground-stateelectron configuration for copper (Cu). Express the electron configuration using superscripts where appropriate. For example, the configuration for Li would be entered as 1s22s1. Which element has the following configuration: [Xe]6s 24f5? Pd has an anomalous electron configuration. Write the observed electron configuration of Pd.Express your answer in complete form in order of increasing orbital energy. A comparison of the electron configurations of nickel (Ni) and copper (Cu) indicates that 1. Cu has two more d electrons and the same number of s electrons as Ni. 2. Cu has one more d electron and the same number of s electrons as Ni. 3. Cu has two more d electrons and one less s electron than Ni. 4. Cu has one more d electron and one less s electron than Ni. 5. Cu has one more d electron and one more s electron than Ni. Consider an atom of sulfur. Indicate whether the statement about an atom of sulfur is true. It has 6 valence electrons. What is the ground-state electron configuration of the sulfide ion S 2-? Express your answer in condensed form, in order of increasing orbital energy. Which element has the following configuration: [Xe]6s24f4 ? Enter the chemical symbol for the element. The atomic number of oxygen is 8, because oxygen has a. a second shell with eight electrons. b. electrons in eight shells. c. eight protons in the nucleus. c. an atomic mass of 8. An atom of chlorine has several valence electrons in itsa. first shell. b. second shell. c. nucleus. d. third shell. What is the ground-state electron configuration of the chloride ion Cl −? Express your answer in condensed form, in order of increasing orbital energy. What is the electron configuration of Li +, Na+, Sr 2+, Cu2+? In what respect does an atom of magnesium, Mg, differ from a magnesium ion, Mg2+? (A) The ion has an inert gas electron configuration; the atom does not. (B) The positive charge on the nucleus of the ion is two units greater than the nuclear charge on the atom. (C) The ion has two more protons than the atom. (D) The ion has two or more planetary electrons than the atom. Which electron configuration is incorrect? a. Zn: [Ar]3d 10 4s 2 b. Ca: [Ar]4s 2 c. Cr: [Ar]3d 4 4s 2 d. Ag: [Kr]4d 10 5s 1 e. All the above are correct. What is the ground-state electron configuration of a neutral atom of manganese? Express your answer in condensed form, in order of increasing orbital energy. The atomic numbers (Z), electron configurations, and numbers of unpaired electrons for five ions are listed in the following table. Assume that all unpaired electrons have parallel spins. Indicate the element symbol, charge, and energy state (ground or excited) for each of the five cases. Why is Ru3+ electron configuration [Kr] 4d5 5s0 instead of having a full s orbital? What is the electron configuration of a nitride ion in its ground state? Fill in the blanks with the correct ground state electron configuration (noble gas configuration) for the given atom or the atom for the given ground state electron configuration. What is the ground-state electron configuration of a neutral atom of nickel? For a multi-electron atom, arrange the electron subshells of the following listing in order of increasing energy:6s, 4f, 2p, 5d. Write the electron configuration of Co3+ (Cobalt 3+ ion). Explain. Identify the outer electron configurations for the (a) alkali metals, (b) alkaline earth metals, (c) halogens, (d) noble gases. a. Enter the full electron configuration for Cl –.b. What is the atomic symbol for the noble gas that also has this electron configuration? Write the full electron configuration of chlorine. Write the noble gas electron configuration for chlorine. How many valence electrons does chlorine have? What is the electron configuration for the Ca 2+ ion (calcium ion)? What is the ground-state electron configuration of the fluoride ion F -? Express your answer in condensed form, in order of increasing orbital energy. What is the ground-state electron configuration of the oxide ion O 2-? Express your answer in condensed form, in order of increasing orbital energy. Write the electron configuration for arsenic (As). Use the periodic table to determine each of the following:a. The number of 3s electrons in Mg.b. The number of 3d electrons in Cr.c. The number of 4d electrons in Mo.d. The number of 6p electrons in Pb. Give the full electron configuration for calcium (Ca). What is the ground state electron configuration of Sn2+? Enter the full electron configuration for S2-. What is the atomic symbol for the noble gas that also has this electron configuration? What is the ground-state electron configuration of the sulfide ion S2−? Express your answer in condensed form, in order of increasing orbital energy. Write the electronic configuration of vanadium(V). How many electrons does a Co atom have in it's 3d subshell? How many of those electrons are unpaired? Which element has the following electron configuration: 1s22s22p63s23p64s23d104p65s24d105p2? What element forms an ion with an electronic configuration of [Ar] and a -2 charge? What element forms an ion with an electronic configuration of [Kr] and a -2 charge? Sort the following electron configurations of neutral atoms based on whether they represent an excited state configuration or a ground state configuration. Explain why Al is a member of group 13 rather than group 3? Give the chemical symbol of an element in the third period (row) of the periodic table with three valence electrons. Give the chemical symbol of an element in the third period (row) of the periodic table with four 3p electrons. Identify the element whose ground-state electron configuration is [Kr] 5s2 4d10 5p4. Give the chemical symbol of an element in the third period (row) of the periodic table with six 3p electrons. Identify the element whose ground-state electron configuration is [Ar] 4s2 3d10 4p2. A certain atom has an [noble gas] 5s2 4d10 5p4 electron configuration. Which element is it? What is the electron configuration of an isolated S atom? What is the electron configuration of an isolated Cl atom? Identify the element: The ground-state electron configuration is [Ne] 3 s2 3p4. Which atom has the electron configuration 1s22s22p63s23p64s23d104p65s24d2? Write the electron configuration for phosphorus. Identify the valence electrons and core electrons. Use the periodic table to write the electron configuration for iodine (I). Consider the element silicon, Si.Write the electron configuration. Name the element described in the following: Condensed ground-state electron configuration of [Ne] 3s23p2. Name the element described in the following: Condensed ground-state electron configuration of [Kr] 5s24d6. Valence electrons are those electrons in the outermost principal quantum level (highest n level) of an atom in its ground state. Groups 1A to 8A have from 1 to 8 valence electrons. For each group of the representative elements (1A–8A), give the number of valence electrons, the general valence electron configuration, a sample element in that group, and the specific valence electron configuration for that element. How many valence electrons does calcium, Ca, have and what are its specific valence electrons? How many valence electrons does oxygen, O, have and what are its specific valence electrons? How many valence electrons does element 117 have and what are its specific valence electrons? How many valence electrons does indium, In, have and what are its specific valence electrons? How many valence electrons does argon, Ar, have and what are its specific valence electrons? How many valence electrons does bismuth, Bi, have and what are its specific valence electrons? Write general outer electron configurations (nsxnpy) for group 6A in the periodic table. Predict the atomic number of the next alkali metal after francium and give its ground-state electron configuration. Consider the following elements: P, Ca, Si, S, Ga.Enter the electron configuration for P.
Write general outer electron configurations (nsxnpy) for group 7A in the periodic table. The elements Si, Ga, As, Ge, Al, Cd, S, and Se are all used in the manufacture of various semiconductor devices. Write the expected electron configuration for these atoms. The elements Cu, O, La, Y, Ba, Tl, and Bi are all found in high-temperature ceramic superconductors. Write the expected electron configuration for these atoms. 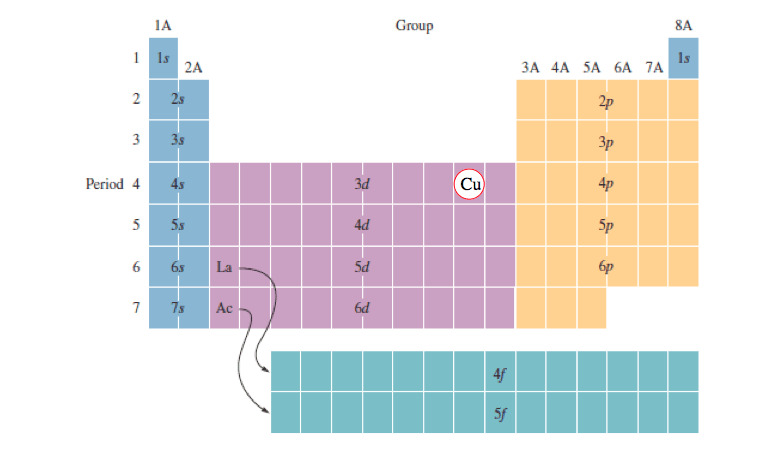 Consider the following elements: P, Ca, Si, S, Ga.Enter the electron configuration for Ca. Consider the following elements: P, Ca, Si, S, Ga.Enter the electron configuration for Si. Consider the following elements: P, Ca, Si, S, Ga.Enter the electron configuration for S.
Write the expected electron configurations for each of the following atoms: Sc, Fe, P, Cs, Eu, Pt, Xe, Br. Consider the following elements: P, Ca, Si, S, Ga.Enter the electron configuration for Ga.
Write the expected electron configurations for each of the following atoms: Cl, Sb, Sr, W, Pb, Cf. The four most abundant elements by mass in the human body are oxygen, carbon, hydrogen, and nitrogen. These four elements make up about 96% of the human body. The next four most abundant elements are calcium, phosphorus, magnesium, and potassium. Write the expected ground-state electron configurations for these eight most abundant elements in the human body. Write the expected ground-state electron configuration for the (as yet undiscovered) alkaline earth metal after radium. Write the expected ground-state electron configuration for the noble gas with electrons occupying 4f orbitals. 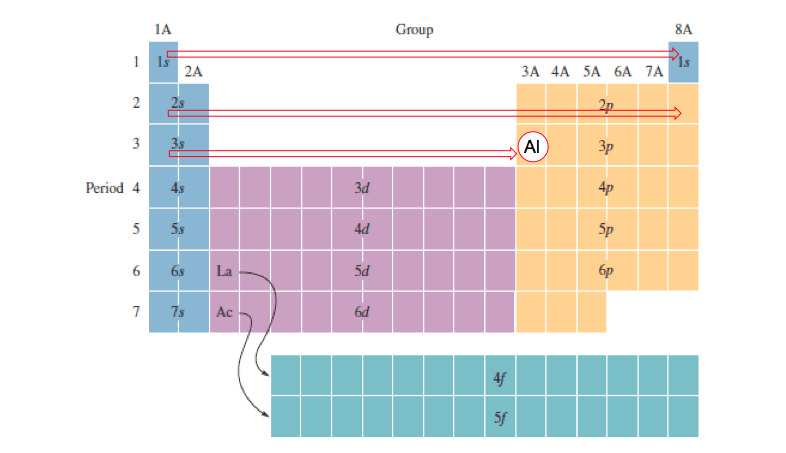 Using only the periodic table inside the front cover of the text, write the expected ground-state electron configuration for the third element in Group 5A. Using only the periodic table inside the front cover of the text, write the expected ground-state electron configuration for element number 116. What is the atomic number of the as yet undiscovered element in which the 8s and 8p electron energy levels fill? Using only the periodic table inside the front cover of the text, write the expected ground-state electron configuration for the halogen with electrons in the 6p atomic orbitals. Which of the following atoms contains only three valence electrons: Li, B, N, F, Ne? Evaluate the expression 2 x 1, 2 x (1 + 3), 2 x (1 + 3 + 5), and 2 x (1 + 3 + 5 + 7). How do the atomic numbers of the noble gases relate to the numbers? Which atom would be expected to have a half-filled 4 s subshell? What is the electron configuration for a silver atom? Cobalt–60 and iodine–131 are radioactive isotopes commonly used in nuclear medicine. How many protons, neutrons, and electrons are in atoms of these isotopes? Write the complete electron configuration for each isotope. Element 106 has been named seaborgium, Sg, in honor of Glenn Seaborg, discoverer of the first transuranium element. What other element would be most like element 106 in its properties? You may want to reference (Pages 245 - 246) Section 6.9 while completing this problem.Identify the group corresponding to elements with the valence-shell electron configuration ns2np5. Predict some of the properties of element 117 (the symbol is Uus, following conventions proposed by the International Union of Pure and Applied Chemistry, or IUPAC). What will be its electron configuration? You may want to reference (Pages 245 - 246) Section 6.9 while completing this problem.Identify the group corresponding to elements that have three unpaired p electrons. You may want to reference (Pages 245 - 246) Section 6.9 while completing this problem.Identify the group and period corresponding to the element whose valence electrons are 4s24p1. An unknown element is a nonmetal and has a valence electron configuration of ns2 np4. How many valence electrons does this element have? You may want to reference (Pages 245 - 246) Section 6.9 while completing this problem.Identify the series corresponding to the d-block elements. Write the condensed electron configurations for the Mg atom. Write the condensed electron configurations for the V atom. Write the condensed electron configurations for the Br atom. Write the condensed electron configurations for the Y atom. Write the condensed electron configurations for the Ge atom. Write the condensed electron configurations for the Lu atom. Atoms of which group in the periodic table have a valence shell electron configuration of ns2np3? Atoms of which group in the periodic table have a valence shell electron configuration of ns2? Refer to the periodic table to write the electron configuration of bismuth (Bi). The two most common isotopes of uranium are 235U and 238U. Using the periodic table in the front-inside cover, write the electron configuration for a U atom. Compare your answer to the electron configuration given in the figure below. How can you explain any differences between these two electron configurations? You may want to reference (Pages 300 - 301) Section 8.1 while completing this problem.Write the electron configuration for the element titanium, Ti. How many valence electrons does this atom possess? Hafnium, Hf, is also found in group 4B. Write the electron configuration for Hf. Write the electron configuration for the element titanium, Ti. Which of the following is the correct condensed electron configuration for the atom or ion indicated?a. The electron configuration of V is [Ar]4s24d3.b. The electron configuration of Al3+ is [Ne]3s23p4.c. The electron configuration of Sb3+ is [Kr]5s24d10.d. The electron configuration of Br+ is [Kr].e. The electron configuration of Co 2+ is [Ar]4s23d5. Identify the element whose excited-state has the electron configuration 1s2 2s2 2p4 3s1. Identify the element: An excited state of this element has the electron configuration 1s2 2s2 2p5 3s1. Identify the element: An excited state of this element has the electron configuration [Kr] 5s2 4d6 5p2 6s1. The following electron configurations represent excited states. Identify the element and enter its ground-state condensed electron configuration.Enter the ground-state condensed electron configuration for F.
The following electron configurations represent excited states. Identify the element and enter its ground-state condensed electron configuration.Enter the ground-state condensed electron configuration for Ge. The following electron configurations represent excited states. Identify the element and enter its ground-state condensed electron configuration.Enter the ground-state condensed electron configuration for Nb. Write the charge and full ground-state electron configuration of the monatomic ion most likely to be formed by P.
Write the charge and full ground-state electron configuration of the monatomic ion most likely to be formed by Mg.
Write the charge and full ground-state electron configuration of the monatomic ion most likely to be formed by Se. Mercury in the environment can exist in oxidation states 0, +1, and +2. One major question in environmental chemistry research is how to best measure the oxidation state of mercury in natural systems; this is made more complicated by the fact that mercury can be reduced or oxidized on surfaces differently than it would be if it were free in solution. XPS, X-ray photoelectron spectroscopy, is a technique related to PES, but instead of using ultraviolet light to eject valence electrons, X-rays are used to eject core electrons. The energies of the core electrons are different for different oxidation states of the element. In one set of experiments, researchers examined mercury contamination of minerals in water. They measured the XPS signals that corresponded to electrons ejected from mercurys 4f orbitals at 105 eV, from an X-ray source that provided 1253.6 eV of energy. The oxygen on the mineral surface gave emitted electron energies at 531 eV, corresponding to the 1s orbital of oxygen. Overall the researchers concluded that oxidation states were +2 for Hg and –2 for O.Write out the ground-state electron configurations for Hg2+ and O2–. Mercury in the environment can exist in oxidation states 0, +1, and +2. One major question in environmental chemistry research is how to best measure the oxidation state of mercury in natural systems; this is made more complicated by the fact that mercury can be reduced or oxidized on surfaces differently than it would be if it were free in solution. XPS, X-ray photoelectron spectroscopy, is a technique related to PES, but instead of using ultraviolet light to eject valence electrons, X-rays are used to eject core electrons. The energies of the core electrons are different for different oxidation states of the element. In one set of experiments, researchers examined mercury contamination of minerals in water. They measured the XPS signals that corresponded to electrons ejected from mercurys 4f orbitals at 105 eV, from an X-ray source that provided 1253.6 eV of energy. The oxygen on the mineral surface gave emitted electron energies at 531 eV, corresponding to the 1s orbital of oxygen. Overall the researchers concluded that oxidation states were +2 for Hg and –2 for O.Which electrons are the valence electrons in each case? Write out the full electron configuration for Al and for the monatomic ion found in binary ionic compounds containing the element. Write out the full electron configuration for Br and for the monatomic ion found in binary ionic compounds containing the element. Write out the full electron configuration for Sr and for the monatomic ion found in binary ionic compounds containing the element. Write out the full electron configuration for Li and for the monatomic ion found in binary ionic compounds containing the element. Write out the full electron configuration for As and for the monatomic ion found in binary ionic compounds containing the element. Write out the full electron configuration for S and for the monatomic ion found in binary ionic compounds containing the element. You may want to reference (Pages 302 - 306) Section 8.2 while completing this problem.Determine which ions have noble-gas configurations: (a) Cd2+, (b) P3–, (c) Zr4+, (d) Ru3+, (e) As3–, (f) Ag+. Which ion with a +1 charge has the electron configuration 1s22s22p63s23p63d104s24p6? Which ion with a –2 charge has this configuration? “Lithium” is often prescribed as a mood-stabilizing drug. Do you think the “lithium” prescribed is in the elemental form? What is the more likely form of lithium to be prescribed as a drug? You may want to reference (Pages 268 - 272) Section 7.4 while completing this problem.Give three examples of ions that have an electron configuration of nd6 (n = 3, 4, 5 ...). Read the labels of several commercial products and identify monatomic ions of at least six main group elements contained in the products. Write the complete electron configurations of these cations and anions. Rubidium and bromine atoms are depicted below.What electronic feature characterizes this pair of ions, and which noble gas are they related to? Write electron configurations for the most stable ion formed by each of the elements Al, Ba, Se, and I (when in stable ionic compounds). You may want to reference (Pages 267 - 272) Section 7.4 while completing this problem.Write the electron configurations for the following ions, and determine which have noble-gas configurations: (a) Ru3+, (b) As3–, (c) Y3+, (d) Pd2+, (e) Pb2+, (f) Au3+. Write electron configurations for the most stable ion formed by each of the elements Te, Cl, Sr, and Li (when in stable ionic compounds). Write the charge and full ground-state electron configuration of the monatomic ion most likely to be formed by Cl. Write the charge and full ground-state electron configuration of the monatomic ion most likely to be formed by Na. Write the charge and full ground-state electron configuration of the monatomic ion most likely to be formed by Ca. Write the charge and full ground-state electron configuration of the monatomic ion most likely to be formed by Rb. Write the charge and full ground-state electron configuration of the monatomic ion most likely to be formed by N.
Write the charge and full ground-state electron configuration of the monatomic ion most likely to be formed by Br. Write the charge and full ground-state electron configuration of the monatomic ion most likely to be formed by Al. What additional information do we need to answer the question “Which ion has the electron configuration 1s22s22p63s23p6”? Write the charge and full ground-state electron configuration of the monatomic ion most likely to be formed by S.
Write the charge and full ground-state electron configuration of the monatomic ion most likely to be formed by Sr. List the elements (ignore the lanthanides and actinides) that have ground-state electron configurations that differ from those we would expect from their positions in the periodic table. Write electron configuration for the cations Sr 2+, Cs+, In+, and Pb2+. Write the electron configuration for the monatomic ion formed from Na. Write the electron configuration for the monatomic ion formed from Mg.
Write the electron configuration for the monatomic ion formed from Ca. Write the electron configuration for the monatomic ion formed from K.
Write the electron configuration for the monatomic ion formed from Sr. The ground electron configuration of a Tc atom is [Kr] 5s2 4d5. What is the electron configuration of a Tc3+ ion? Write the electron configuration for the following ion: Cd2+. Write the electron configuration for the following ion: Zr4+. Write the electron configuration for the following ion: Ru3+. Write the electron configuration for the following ion: Ag+. Name the element described in the following: Forms 2+ ion with electron configuration [Ar] 3d3. Name the element described in the following: Period 5 element that forms 3+ ion with pseudo–noble gas configuration. Use electron configurations to account for the stability of the lanthanide ions Ce 4+ and Eu2+. Zinc in its 2+ oxidation state is an essential metal ion for life. Zn2+ is found bound to many proteins that are involved in biological processes, but unfortunately Zn2+ is hard to detect by common chemical methods. Therefore, scientists who are interested in studying Zn2+-containing proteins will frequently substitute Cd2+ for Zn2+, since Cd2+ is easier to detect.Proteins that speed up (catalyze) chemical reactions are called enzymes. Many enzymes are required for proper metabolic reactions in the body. One problem with using Cd2+ to replace Zn2+ in enzymes is that Cd2+ substitution can decrease or even eliminate enzymatic activity. Can you suggest a different metal ion that might replace Zn2+ in enzymes instead of Cd2+? Read the labels of several commercial products and identify monatomic ions of at least four transition elements contained in the products. Write the complete electron configurations of these cations. In one area of Australia, the cattle did not thrive despite the presence of suitable forage. An investigation showed the cause to be the absence of sufficient cobalt in the soil. Cobalt forms cations in two oxidation states, Co2+ and Co3+. Write the electron structure of the two cations. Thallium was used as a poison in the Agatha Christie mystery story “The Pale Horse.” Thallium has two possible cationic forms, +1 and +3. The +1 compounds are the more stable. Write the electron structure of the +1 cation of thallium. Write electron configuration for the cations Mg2+, K+, and Al3+. Write electron configuration for the anions N3—, O2—, F—, and Te2—. Write electron configuration for the the anions P 3—, S2—, and Br —. Write the electron configuration for the monatomic ion formed from Cl. Write the electron configuration for the monatomic ion formed from Br. Write the electron configuration for the monatomic ion formed from F.
You may want to reference (Pages 302 - 306) Section 8.2 while completing this problem.Write the electron configuration for Br–. Write the electron configuration for the following ion: P3-. Write the electron configuration for the following ion: As3-. An unknown element is a nonmetal and has a valence electron configuration of ns2 np4. What is the formula of the compound this element would form with potassium? Part A What is the electronic configuration for the ion formed when nitrogen gains three electrons: Express your answer in complete form, in order of increasing orbital energy. For example, 1s22s2 would be entered as 1s22s2. Part B Enter the symbol for the ion formed when nitrogen gains three electrons. A monatomic ion with a charge of +2 has an electronic configuration of 1s 22s22p6. This ion is (n) ___________. What is the chemical symbol of the noble gas this ion is isoelectronic with? What is the formula of the ion? How many electrons must each element gain or lose to have the same electron confguration as Ne? What element forms an ion with an electronic configuration of [Xe] and a -2 charge? Give the symbol for the element. Write the corresponding electron configuration for the following pictorial representation. Give the full electron configuration (do not use the noble gas abbreviation). Name the element, assuming that the configuration describes a neutral atom. Write electron configuration for the following ion.As3−Express your answer in condensed form in order of increasing orbital energy as a string without blank space between orbitals. A monatomic ion with a charge of +1 has an electronic configuration of 1s22s22p63s23p64s23d104p6 This ion is a(n) ____________.What is the chemical symbol of the noble gas this ion is isoelectronic with? What is the formula of the ion? Consider the element with the electron configuration [Xe]6s24f7. This element is (a) a representative element. (b) a lanthanide element. (c) a nonmetal. (d) an actinide clement. (e) a noble gas. Write the corresponding electron configuration for the following pictorial representation. Given the full electron configuration (do not use the noble gas abbreviation). Name the element, assuming that the configuration described a neutral atom. Here is the ground-state electron configuration of a +2 cation of an unknown Element E. Use this diagram to answer the questions below. Write the corresponding electron configuration for the following pictorial representation. Give the full electron configuration (do not use the noble gas abbreviation).Name the element assuming that the configuration descries a neutral atom. Enter the full electron configuration for P3-. What is the atomic symbol for the noble gas that also has this electron configuration? Identify the atom with the following ground-state electron configuration: [Ar] 4s2 3d8Express your answer as a chemical symbol. Enter the full electron configuration for Cl-. What is the atomic symbol for the noble gas that also has this electron configuration? Which statement is true of the atom with an electron configuration of 1s2 2s2 2p6 3s1?a. This is the electron configuration for sodium.b. 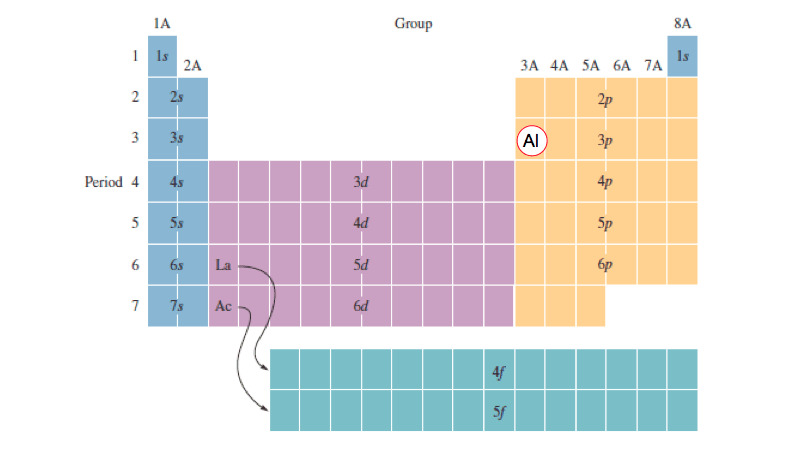 This element is in Group 1A.c. This element is in Period 3.d. All of these are true. Classify each statement as true or false. Drag the appropriate items to their respective bins. List all orbitals from 1s through 5s according to increasing energy for multielectron atoms. Rank orbitals from smallest to largest energy.1s,3p,4p,3s,3d,4s,2p,2s,5s. A. Enter the ground-state condensed electron configuration for Ge.B. Enter the ground-state condensed electron configuration for Nb.Express your answer in condensed form in order of increasing orbital energy as a string without blank space between orbitals. Give the actual ground-state electron configuration for copper (Cu). Complete the ground-state electron configuration for Zinc ion and Thallium(lll) ion (using the noble gas abbreviation) and identify the charge. Write electron configuration for the following ion.Y3+Express your answer in condensed form in order of increasing orbital energy as a string without blank space between orbitals. What is the ground-state electron configuration of a neutral atom of titanium? Express your answer in condensed form, in order of increasing orbital energy. What is the ground-state electron configuration of the fluoride ion F−?Express your answer in condensed form, in order of increasing orbital energy. Give the ground-state electron configuration for silicon (Si) using noble-gas shorthand.Express your answer in condensed form as a series of orbitals. Determine the element of lowest atomic number that contains a half-filled d subshell in the ground state. What element is represented by the electron configuration 1s2 2s2 2p6 3s2 3p2 ? Write the ground-state electron configuration for calcium, Ca. Which element has the following configuration: [Xe]6s 24f 4? Enter the chemical symbol for the element. Which atom would be expected to have a half-filled 6p subshell? a) Give the ground-state electron configuration for silicon (Si).b) Give the actual ground-state electron configuration for copper (Cu). Which atom has the electron configuration 1s22s22p63s23p63d74s2? What is the ground-state electron configuration of a neutral atom of iron? Express your answer in condensed form, in order of increasing orbital energy.